Aug. 26, 2016, 10:30 a.m. It was younger family members calling and texting to say they saw the clip of him saying “Pennsylvania has the worst charter school laws in the nation.” DePasquale had no idea, of course. He’s not a subscriber. For the last several months, DePasquale has railed against Pennsylvania’s charter laws. He came out with an audit of Philadelphia’s charter situation earlier this year and has continued to stress the need for reform throughout the summer. Just yesterday he gave a press conference about a faulty payment appeals process that overly benefits charters at the expense of school districts. So he’s continually tried to bring awareness. But getting featured on Oliver? Here’s what DePasquale finds to be the worst aspects of charter schools in Pennsylvania, a few ways to improve them and why he’s optimistic change might finally happen to Pennsylvania’s charter laws, which date back to the late 1990s. Um, how long do you have? The law is really old: Pennsylvania’s Charter School Law was set in 1997. DePasquale said it hasn’t been changed since then, despite numerous developments, particularly the number of charters increasing far beyond what was thought possible back then. Pennsylvania had 162 charters in the 2014-15 school year, with a little more than half of them based in Philly. The approach to special education funding: School districts provide flat rates to charter schools for students with disabilities, rather than a tiered approach that would give certain amounts based on the severity of a given child’s disability. DePasquale believes doing this would free up money to be used elsewhere in the district. The five-year charter approval plan: Under the current law, charter schools are granted charters for three or five years. DePasquale said this means schools can get away with almost anything for four years before having to worry about reapplying for a charter. The payment appeals process: This is what DePasquale brought up at a press conference yesterday. He said charters that don’t receive their monthly payment from the school district can just file with the Pennsylvania Department of Education to get the money, and the Department then subtracts the given amount from the district’s subsidy. If the school district objects, the audit found, it has to go through a lengthy appeals process that because of the confusing, long nature of the appeal tends to favor the charter. DePasquale found the Department of Education had paid $15 million in disputed tuition to charters from the Philadelphia School District without giving the school district a proper opportunity to appeal. Special education funding: As mentioned above, DePasquale would like to see a tiered system for funding special ed students. Bills enacting a tiered approach have been proposed in the House and Senate but not passed. The lease reimbursement process: Charter schools that own their buildings are not supposed to get reimbursements for leases, per state guidelines. But an audit from DePasquale earlier this month found instances where owners of charter schools created separate legal entities that own the buildings and then lease them for charter schools, allowing for them to get a lease reimbursement from the state. DePasquale would like more stringent regulations for this process. Cyber funding: Charter schools that serve students online receive money from school districts where the student is based, even though the cyber school has no brick-and-mortar location. As Newsworks pointed out, this means a charter based in Altoona serving a student who lives in the Philadelphia suburbs would get upwards of $20,000 and for a student in an urban or rural district somewhere closer to $10,000. But both students are getting the same service. The location is irrelevant. To top it off, whatever’s left over after cyber school expenses are covered can be pocketed by the charter school operator. DePasquale would like to replace the district spending for cyber charters with direct payments from the state. Coincidentally, Gov. 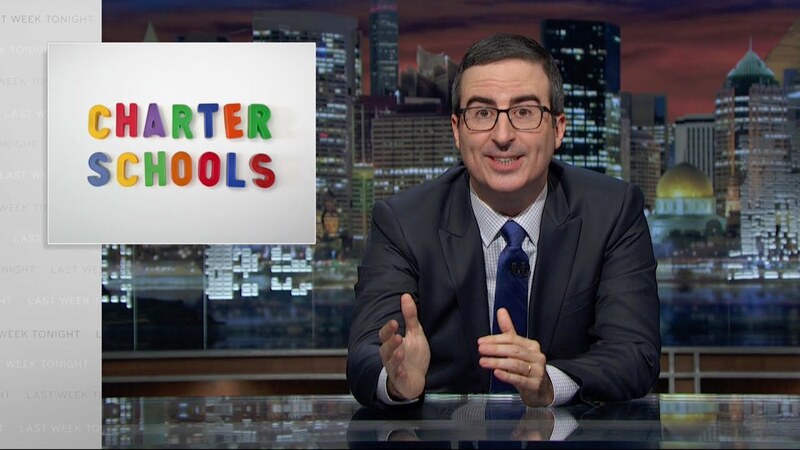 Tom Wolf followed up the Oliver segment on charters by announcing the creation of a new division of the Pennsylvania Department of Education that focuses solely on charters. The division aims to work with charter school educators and leaders to improve student achievement, community involvement and fiscal responsibility. It’s also going to take a closer look at cyber charters. DePasquale finds this step to be particularly important to charter reform because Governors Ed Rendell and Tom Corbett did nothing similar during their tenures. Whenever proposed changes arose, it came from the legislature. And though a couple of bills passed one of the houses, they’d never make it all the way. DePasquale attributes some of their failure to money. As auditor general, he’s had success leading reforms to laws such as texting while driving. But very few groups, if any, opposed such changes. Changes to charter laws could lead to winners and losers, and the people who would lose have lobbied to make sure that doesn’t happen. With Wolf’s new office, he hopes it’ll be different and the possibility for change will be taken more seriously.